WHATEVER IS FRESH — from your garden or your neighbor’s garden, from a farmers’ market, fruit-and-vegetable stand, u-pick farm or along a path, growing edible and wild — well, that’s what you should be eating right now. 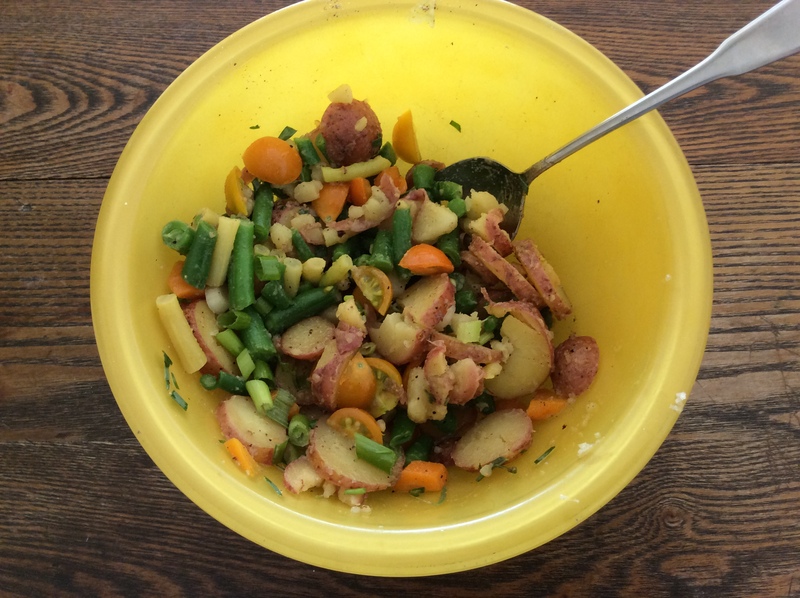 For me, the vegetables and herbs lately include tender carrots and stringbeans (green or yellow), tiny new potatoes, nice little cauliflowers, fresh garlic, cherry tomatoes, basil, parsley, tarragon and mint. And summer fruit: Bluecrop blueberries that I picked at a wonderful organic blueberry farm (Yes, I may have to make the seasonal favored coffeecake, Blueberry Boy Bait ), blackberries from the bushes that grow wild here, and melons — watermelon, cantaloupe, honeydew — from a produce stand. What to do with them? 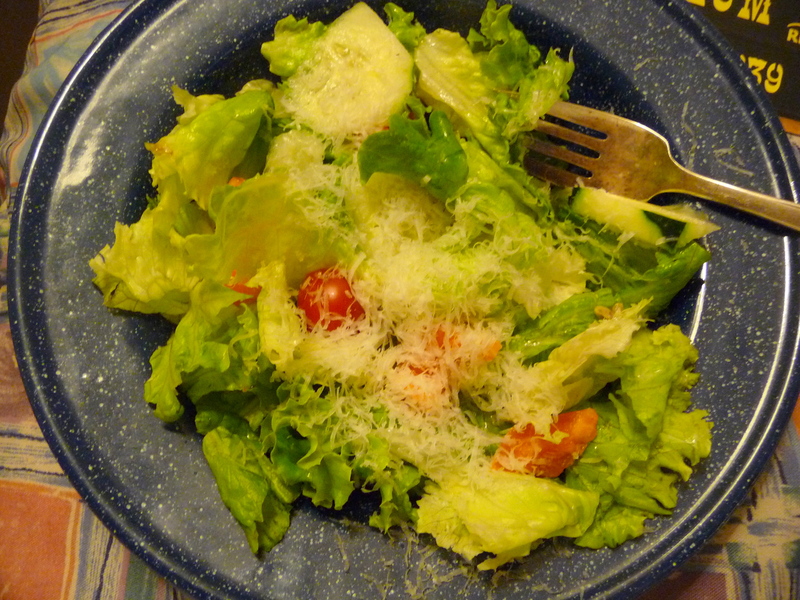 Well, it’s a theme I keep coming back to — salad. It doesn’t require much cooking, and it’s perfect for summer eating — lunch, dinner, picnics, road trips, snacks. 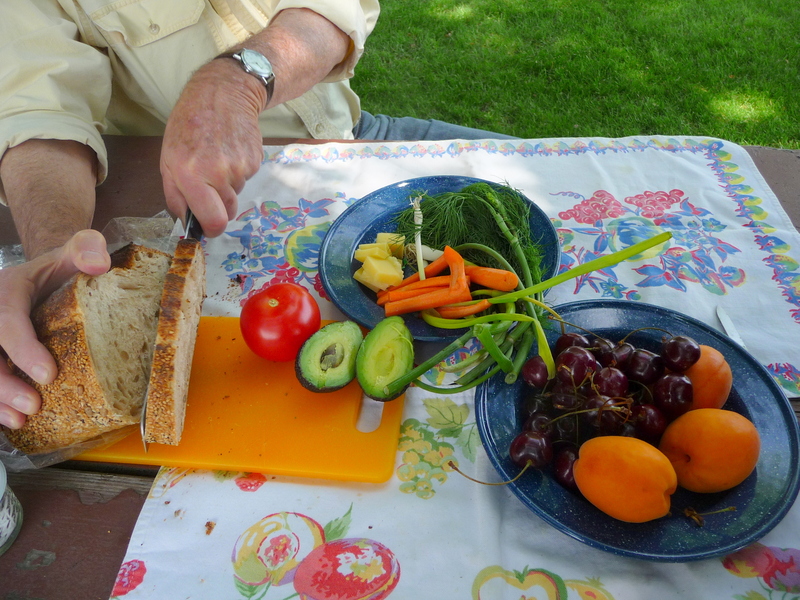 . .
Once again, we took a road trip to Eastern Montana in July and I was determined to be prepared with food. We’re not terribly picky eaters, but we don’t eat much meat and we prefer lots of fresh fruits and vegetables — a difficult situation for this part of the country. 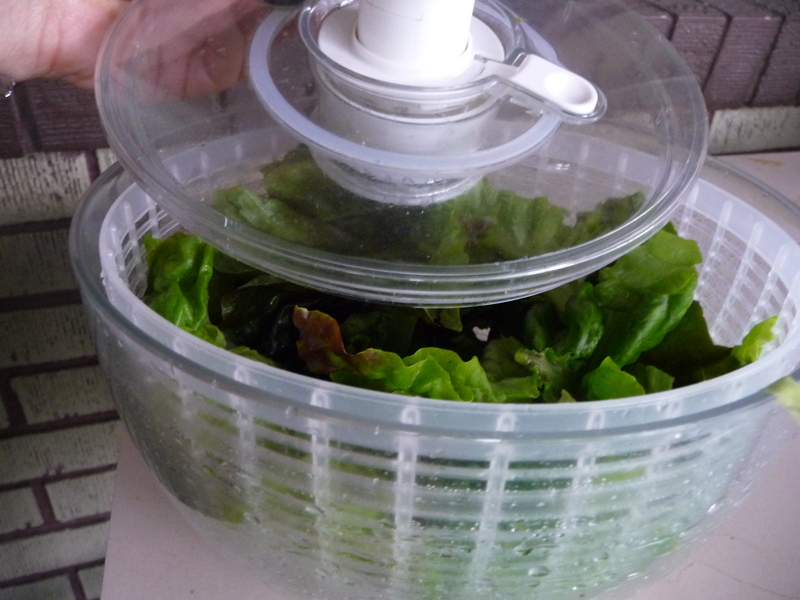 Well, this time, in addition to stocking the car with cooking supplies for motel cooking (including the electric kettle and a large supply of bulgur) and picnics, as I’ve written about in this blog the past couple summers, I brought along my salad spinner. 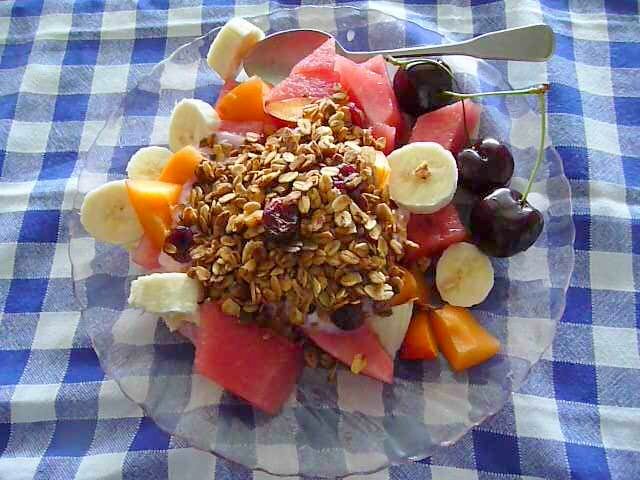 I was so glad I did, because every day of this trip was HOT (in Miles City, a bank thermometer read 111 degrees one day) and we were often eating salads or fresh fruit (washed in the spinner) accompanied by bread. 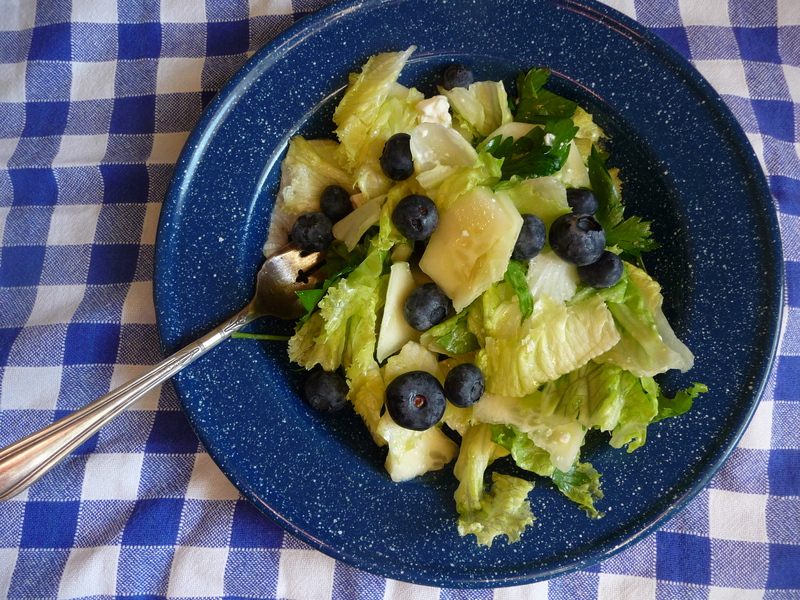 I love a simple oil-lemon dressing on our salads, so I brought olive oil, lots of lemons (when I ran out, I could find more, even in the remotest town) and salt. Also a little pecorino to sometimes grate on top. And yes, I brought my lemon reamer and a zester, which I used for grating. 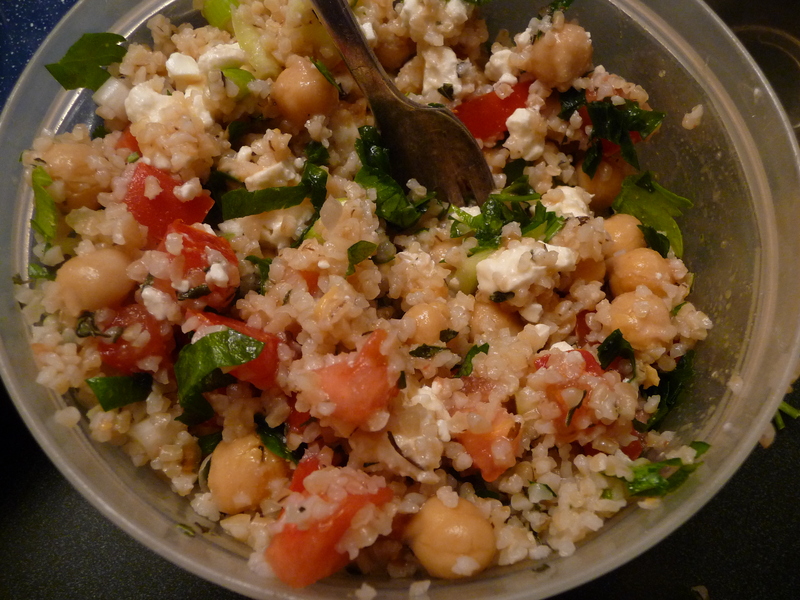 A couple of times I did make a bulgur salad with garbanzo beans and whatever fresh vegetables I could find. 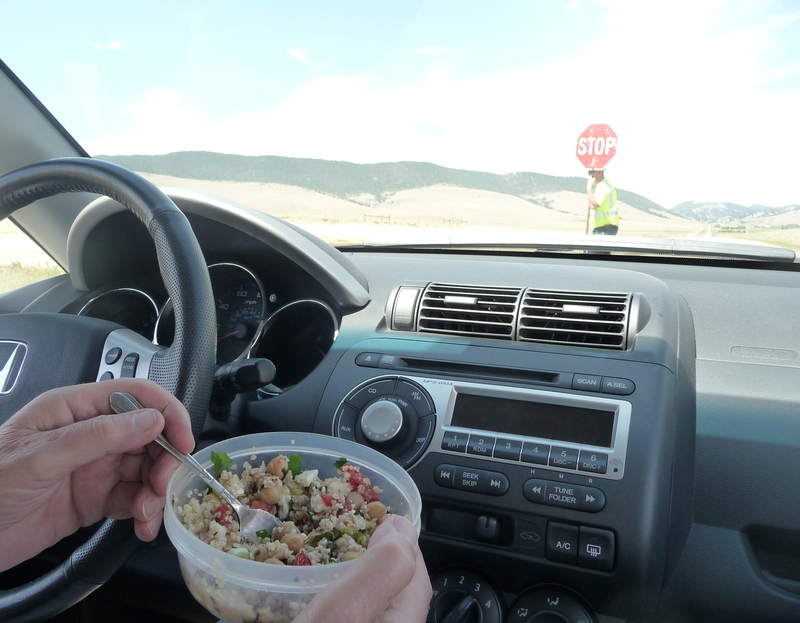 One day I was really glad I had some leftover salad in the little ice chest because we were stopped for road construction for about 20 minutes — right at lunch time! It wasn’t exactly a picnic environment, but that salad did hit the spot! 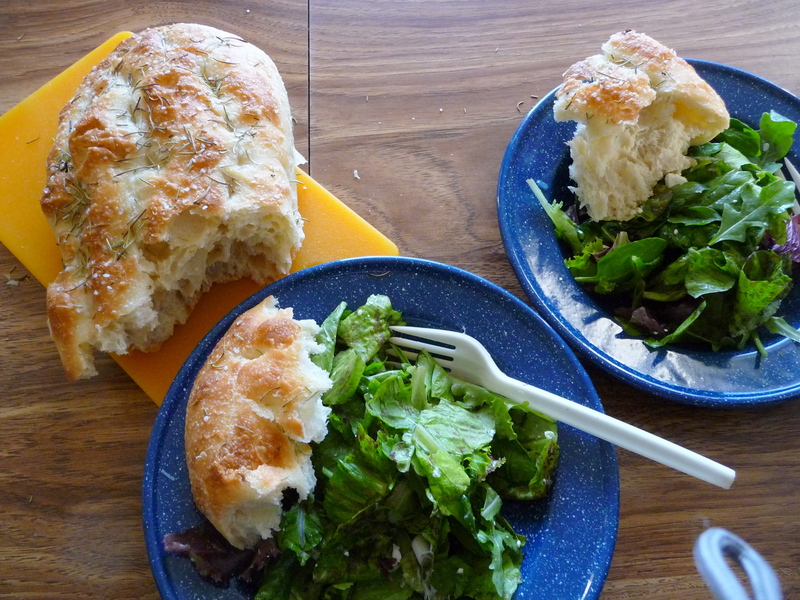 But a salad can be pretty lonely without good bread. 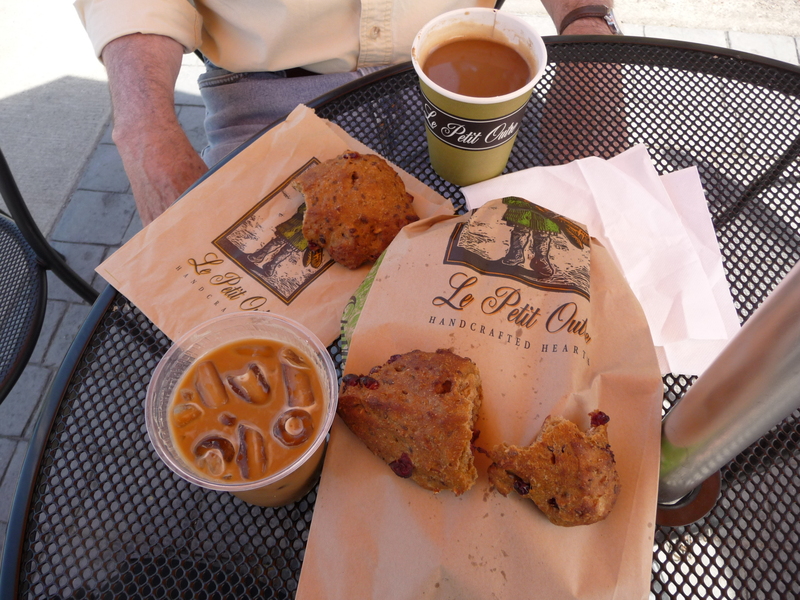 (If you’re going through Missoula, be sure to stop at Le Petit Outre.) Between good bakeries, we relied on our supply of Ak-Maks and other crackers. Okay, it’s nice to have a knife and a cutting board, and even (if you want to get fancy) some pretty cloths to put on a picnic table. Yes, it does require some preparation, but it’s so worth it. I remember road trips with my parents, where we would stop at shady parks for lunch, which often consisted of sandwiches with cream cheese and grapes — which we children loved. On our recent trip, at a forested rest stop in Idaho, we saw a Japanese family with three generations enjoying a huge picnic, including miso soup and hot noodles. 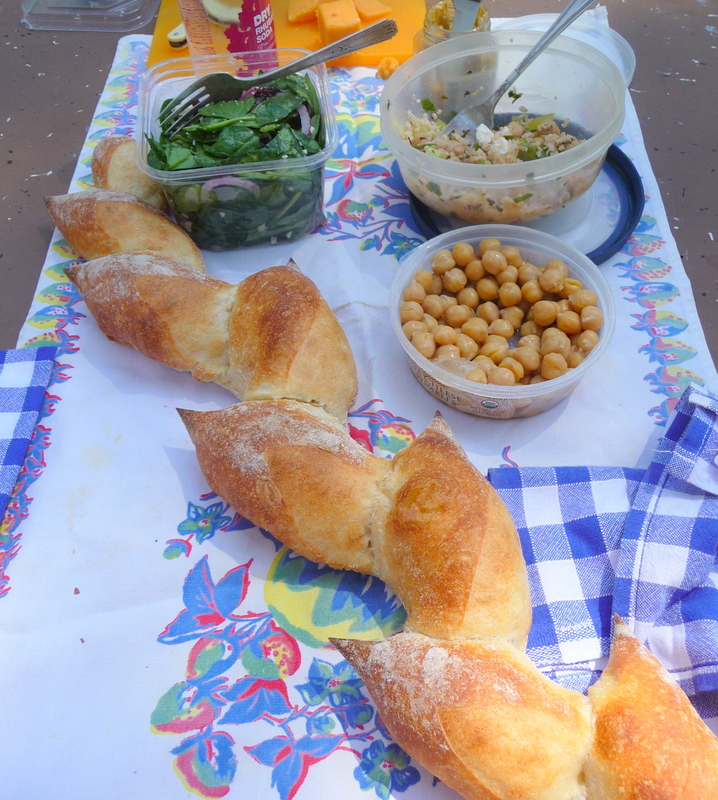 Whatever your food preferences are–even if it’s takeout– as always, my motto is: Whenever possible, make it a picnic! 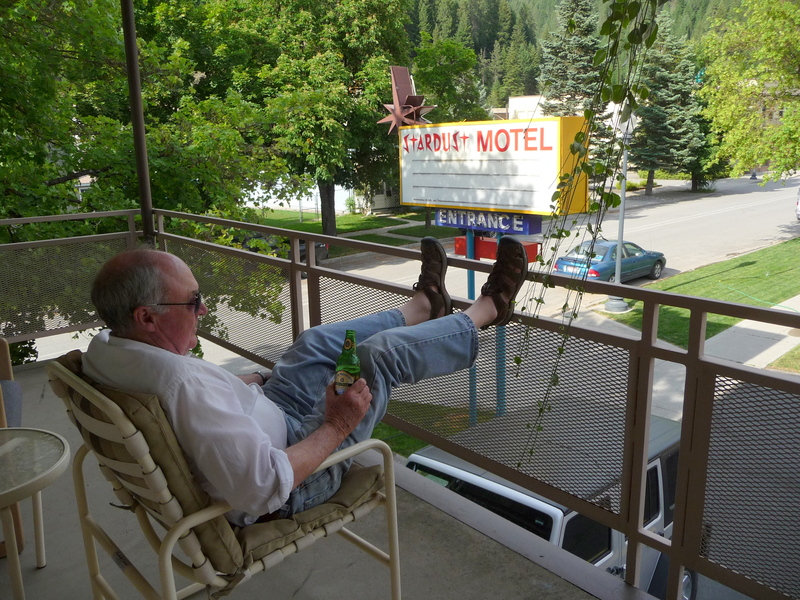 We recently returned from yet another great road trip to Montana. We’re not big meat eaters, so dining out is always a challenge in the interior West. 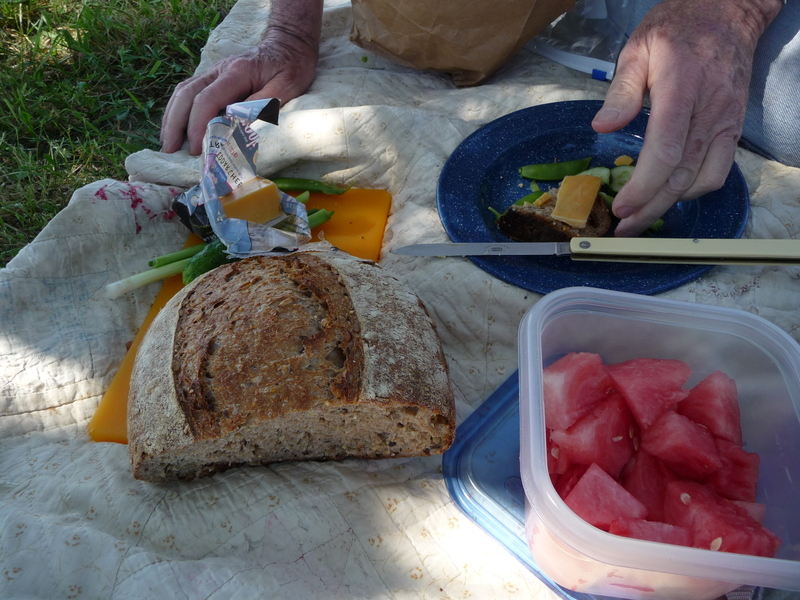 As an alternative (and an economical one too), we ate a lot of picnics on the road. 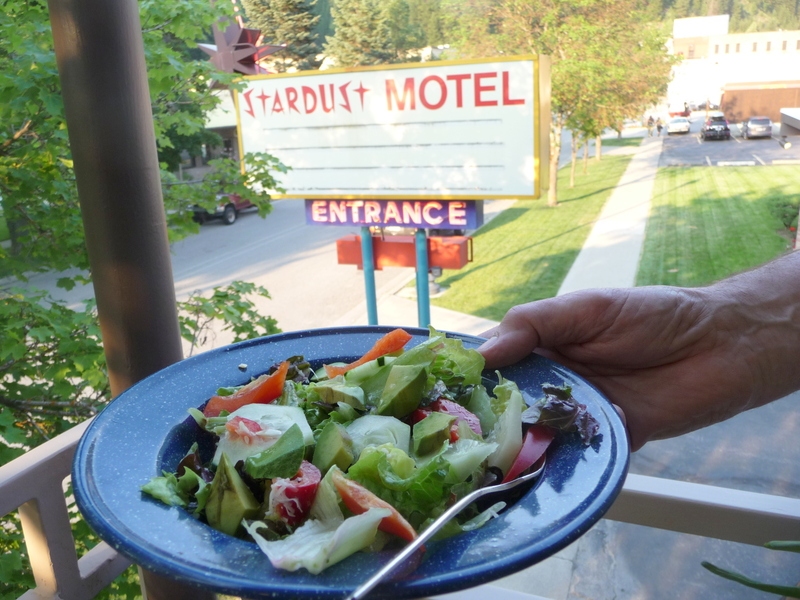 Focaccia from Missoula made a great accompaniment to salad in our motel room in Davenport, Wash. on the return trip. 2. Never pass up a fruit stand or farmers’ market. 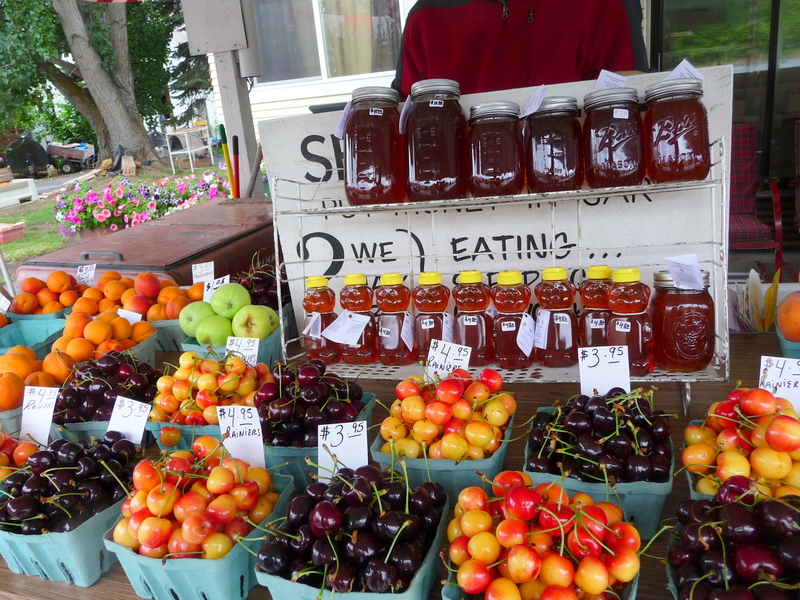 Missoula has a wonderful farmers' market on Saturdays. 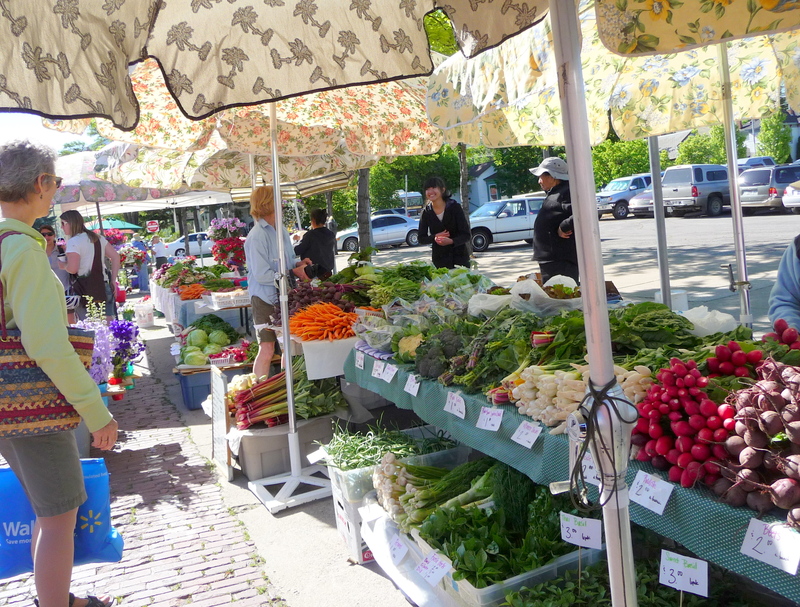 My friend Kathy also recommends the Livingston farmers' market on Wednesday afternoons. 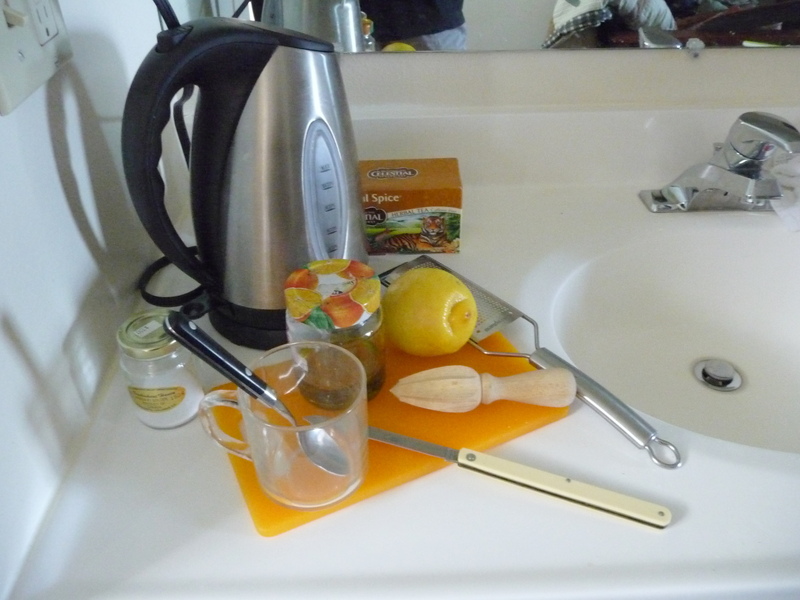 I did a lot less cooking than last year’s motel cooking extravaganza, but I still brought along the important supplies: electric tea kettle, cutting board, knife, can opener, lemon reamer, bulgur, olive oil and salt, which resulted in some nice salad dressings (my basic lemon, olive oil and salt dressing is good on nearly everything) and a couple of bulgur-vegetable salads. 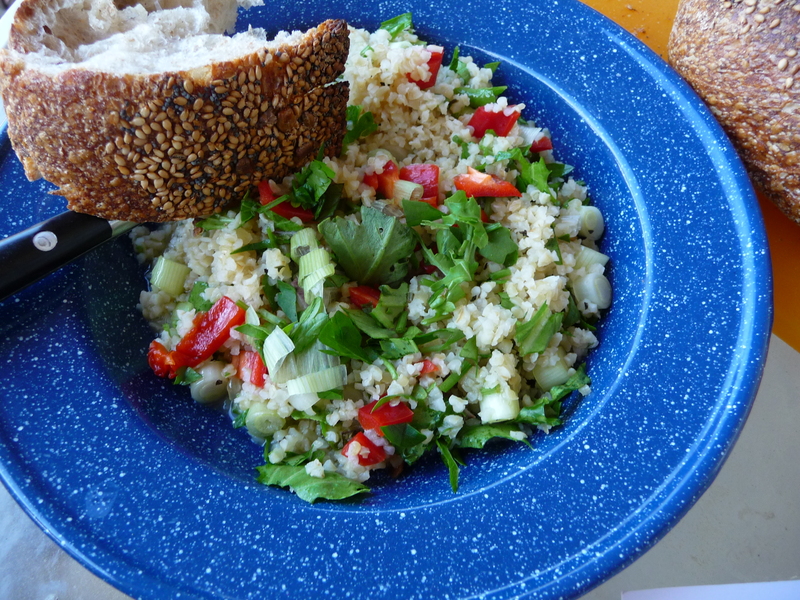 Bulgur salad with plenty of vegetables (along with bread from Anjou Bakery in Cashmere, Wash.) was a good change from the bread & cheese combo. Our picnics often took place outside a motel room. 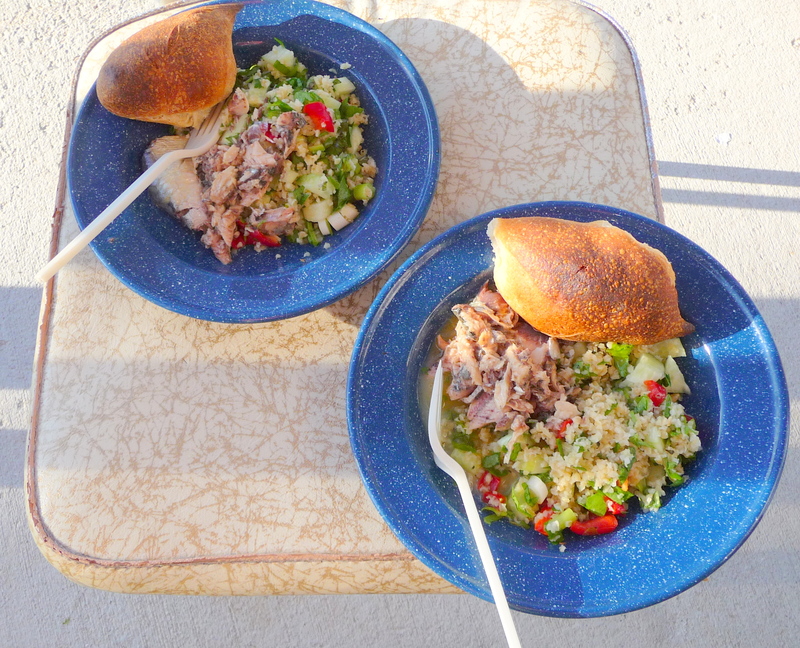 I put together this meal of bulgur salad and tuna in the "rustic" Highlander Motel in White Sulfur Springs (W.S.S. ), Montana. 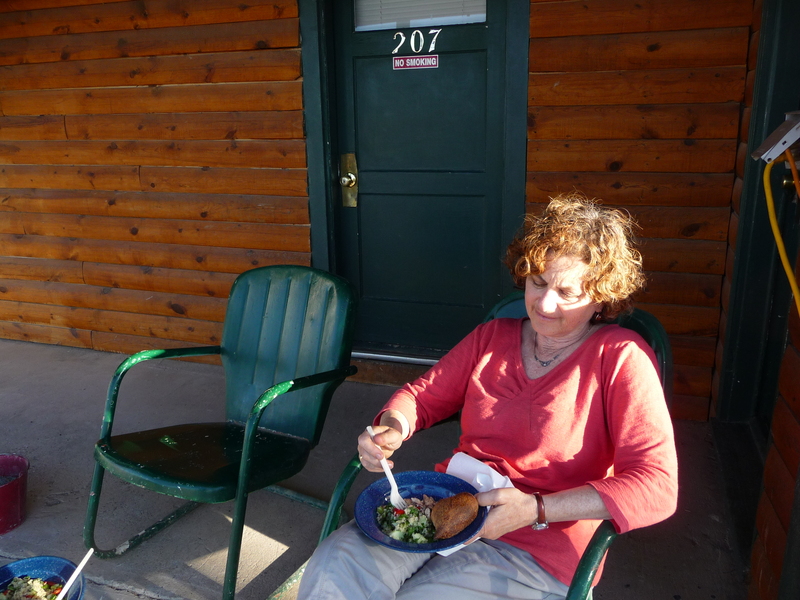 We tried eating outside the motel room, until the mosquitoes emerged. 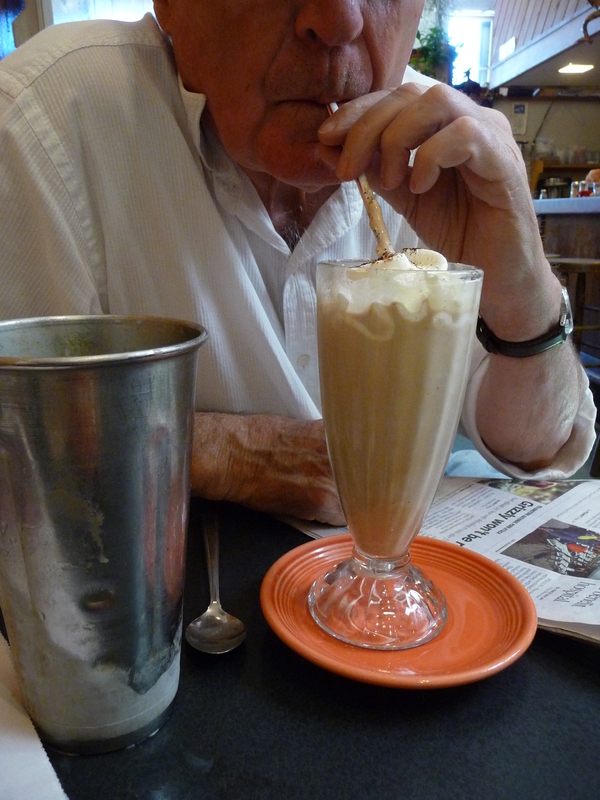 As for eating out, a couple times we indulged in a milk shake as a meal replacement. Steve particularly likes going out to breakfast, but after some disappointing breakfasts at promising-looking cafes, I came up with a guideline for telling when a place might be most likely to fulfill that promise: If a cafe offers hash browns or home fries made from scratch, rather than slabs of processed frozen spuds, there’s a better chance of a good breakfast. 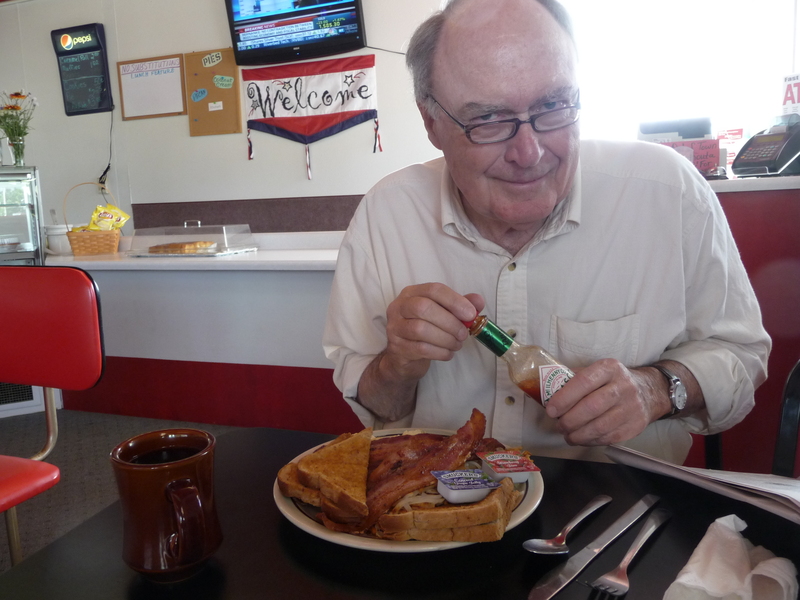 The Dizzy Diner in Terry, Montana, used frozen hash browns, but Steve liked his breakfast anyway. I only had a cup of coffee here. 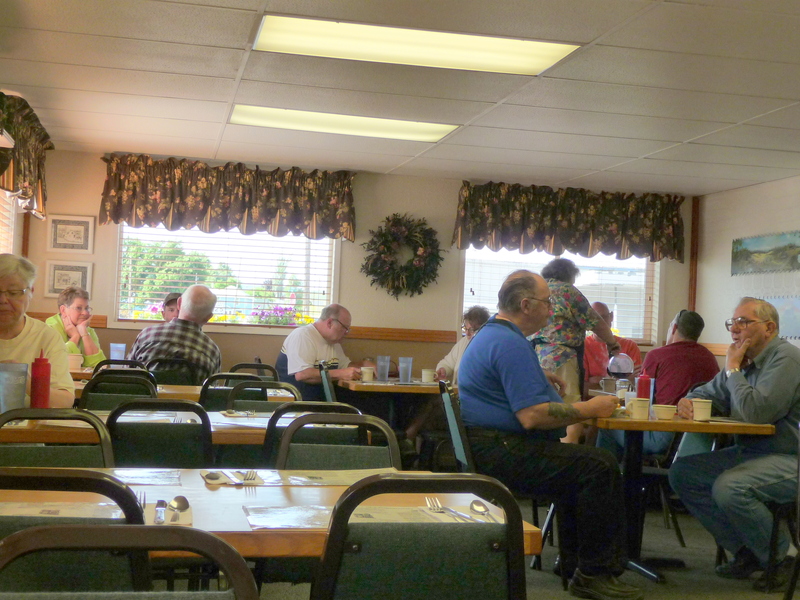 The Corner Cafe in Creston, Washington, makes their hash browns from scratch. I complimented the cook. 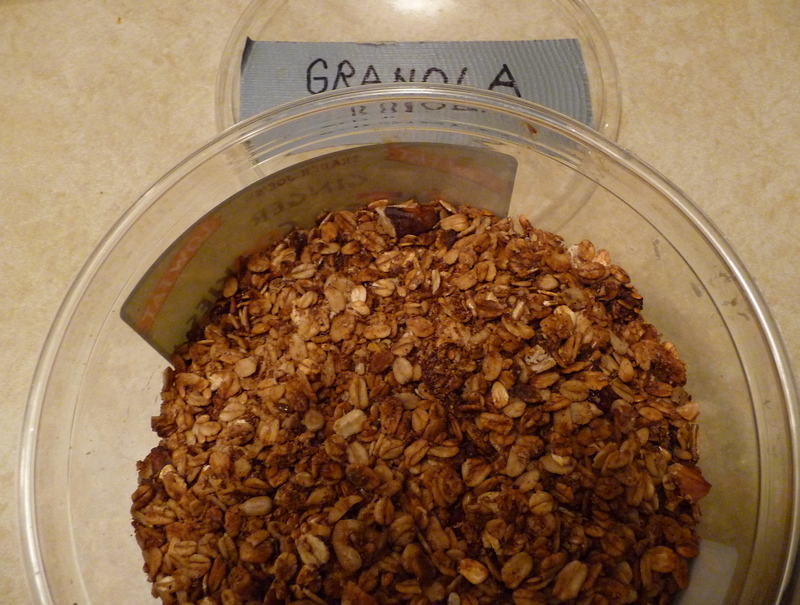 In regard to breakfast, another aspect that helped me out was bringing along a good stash of homemade granola. 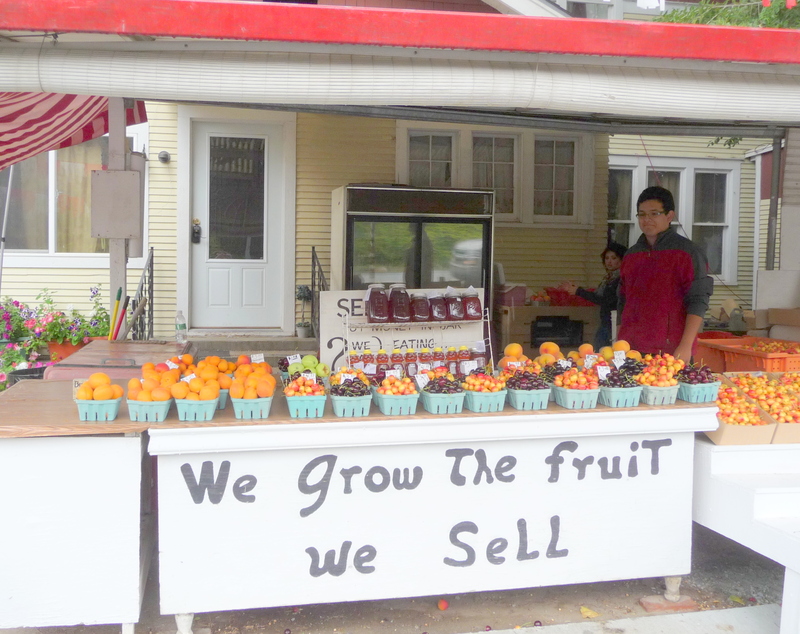 On the way home, we stopped again at that fruit stand in Orondo, Wash.
We bought cherries and apricots. And honey. Breakfast at home the next day was mighty good too! p.s. 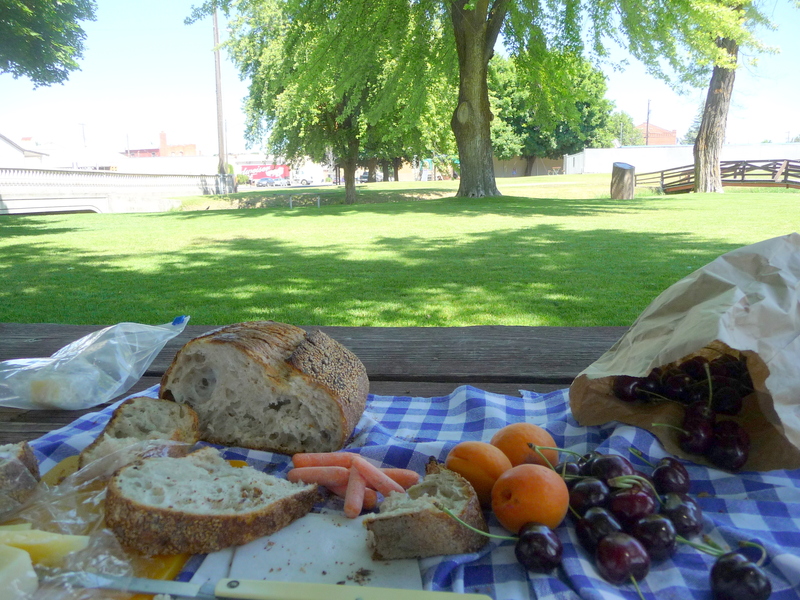 Some places it’s easier to find good picnic food — I really like this post about picnics in Europe.